The Kokoda Trail or Track is a single-file foot thoroughfare that runs 96 kilometres — 60 kilometres in a straight line — through the Owen Stanley Range in Papua New Guinea. The track is the most famous in Papua New Guinea and is renowned as the location of the World War II battle between Japanese and Australian forces in 1942. More information about the Kokoda Campaign can be viewed here. The track starts, or ends, at Owers Corner in Central Province, 50 kilometres east of Port Moresby, and then crosses rugged and isolated terrain, which is only passable on foot, to the village of Kokoda in Oro Province. It reaches a height of 2,190 metres (7,185 ft) as it passes around the peak of Mount Bellamy. Hot and humid days with intensely cold nights, torrential rainfall and the risk of endemic tropical diseases such as malaria, make it a challenge to walk. Despite the challenge posed it is a popular hike that takes between four and twelve days (depending on fitness). Locals have been known to hike the route in three days. 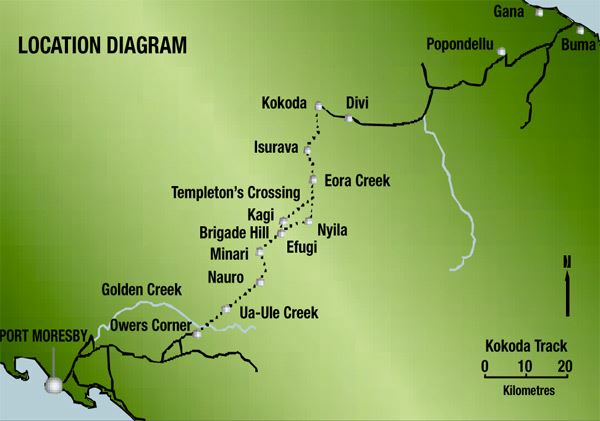 Download your copy of the Kokoda Trail map and view our flyover video. Take the ultimate challenge of trekking the Kokoda - one of the world's great adventure treks, but with the best preparation and support available to ensure you not only finish the adventure, you have the time of your life! Joining the South and North coasts of Papua New Guinea, it is a challenge to be enjoyed by all. PNG's Kokoda Track is one of the most fulfilling treks you will find with a 96km Trail cutting across razor edged ridges and over steep towering mountains, then descend deep into the rainforest and jungles of ferns, spectacular scenery and towering trees entwined with creepers. You will pass through mountain streams on manmade bridges of vine and logs, as the translucent water tumbles its way down into the steep valleys. Rest in relaxed, untouched villages, where you will be warmly welcomed with smiles and fresh fruit and vegetables. The Kokoda Track is also the home of the "Fuzzy Wuzzy Angels" - the local villagers who risked their lives in the Second World War to assist the Aussie’s to resist the Japanese advance. The Kokoda Trail was the site of one of the most critical and bloody campaigns of World War II. Three thousand Japanese and 600 Australians died on the Kokoda Trail in seven months. It was on the Kokoda Trail that the Australians fought the Japanese Army's last attempt to capture Port Moresby. In the end it was the Kokoda Trail that proved to be invincible as neither side could maintain a supply line over its distance. Today the Kokoda Trail is one of the most beautiful and peaceful walks on earth, however there is still evidence of the war and we sometimes find remnants in the jungle, and the older men of the villages bask in telling their stories of the "Fight". The trek is not rushed and we walk it in eight days, which gives you time adjust, acclimatise and find your own pace. Completing the Kokoda Trail will give you a deep sense of achievement. The terrain can be difficult and the weather on the track is unpredictable and you have to be willing for anything, and our training program will help prepare you for this. All your Kokoda guides are qualified and speak English, with one porter accompanying each person to assist carrying tents, cooking and other necessary equipment. We have a satellite telephone, comprehensive emergency plans, insurance and thorough knowledge of the PNG area, having taken more than 300 clients along the infamous track. The package includes all flights, meals, taxes, accommodation and the all-important pre-trekking training program. During the adventure, we will also take you through the history and significance of each part of the trail, telling the story of each infamous battle along the way. It is really quite amazing to witness what our diggers did and the memories and sense of achievement will stay with you for your lifetime and we will offer the best support you can get before and during the trek. This morning you will be up early to meet transport which will convey you to Bomana Cemetery for the dawn service. Here we will pay our respects for the fallen soldiers of the Kokoda campaign. After this you will be transported back to the hotel for breakfast and then we will head to the Port Moresby Yacht club for traditional two up, BBQ and watch the Anzac Day march on the big screen. Directly after lunch you be transported to PNG international airport for your flight home.